Maryjo is a local food and mommy blogger with a wealth of food knowledge and experiences. She spent many years consulting with a multitude of Chefs, introducing them to up-and-coming food products and current culinary trends. She has also done a fair amount of international travel, taking the opportunity to learn traditional recipes hands-on in the kitchens of friends and family. In her spare time she enjoys paddle boarding, kayaking and hiking. Visit Maryjo's blog at www.justanothermomhq.com. Local residents will recognize Marilyn Montemayor from her successful 30-year catering business in Sheboygan. As a private chef, she specialized in catering parties and events held in personal homes, never utilizing a commercial kitchen. Even if she catered a wedding, it was in the client's home. No one knows their way around a home kitchen like Marilyn! Marilyn is now retired and occasionally teaches classes at Relish Kitchen Store. She has previously taught at the John Michael Kohler Arts Center, the Sheboygan Senior Center, and Bookworm Gardens. Melody's deep appreciation for eclectic cuisine was developed at a young age. Growing up all across the United States, she was exposed to a variety of foods that would fuel her life long passion for cooking. Melody began her culinary career at age 19, working in the kitchen of the well-known French restaurant Bistro 157 in the trendy town of Valparaiso, Indiana. At age 24, Melody became a private chef and catering company owner, and began growing all of her own produce. Melody relocated to Sheboygan in 2012 where she expanded her farm to grow 150 varieties of heirloom vegetables, free range meat and egg chickens, and raised goats for milk and cheese. Melody followed the growth of her farm with a share and bounty program she personally farmed called Village Side Farm and CSA. Five years later, after her children were all in school, Melody took her passion for cooking back into the kitchen at the world-renowned American Club resort in Kohler. Melody is currently the Executive Pastry Chef at The Black Pig in Downtown Sheboygan, where she brings a wealth of knowledge and creativity to the talented team of chefs. In her 30-year career at at the Milwaukee Public Library, Susan cultivated her teaching and instructional skills. Combining her skills with her love for Indian cuisine, Susan put her passion into practice and became an expert on the ins and outs of vegetarian Indian cooking. 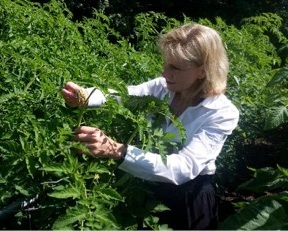 Also a Certified Ayurveda Practitioner (CAP), Susan's unique skill set allows her to honor food as the most important source of medicine and good health. She recently collaborated on an Indian cookbook and will soon be teaching Indian cuisine at UW-Milwaukee. Let Susan take you on the cooking pilgrimage of a lifetime! Kate Pearce is a Nutrition Specialist, Wellness Coach, and Registered Nurse. She has baked over 2,000 sourdough loaves since a snowy day in February 2012 when the “sourdough starter was born.” She believes in homegrown goodness through gardening, foraging and tapping 150+ trees for maple syrup. Kate grew up on a dairy farm, learning the basics of food science hands-on. Later earning a B.S. in Meat Science at UW-Madison, she worked in a meats laboratory, transforming carcasses into value-added meats. She later went on to be a state and national meats judge for 20 years while also developing specialized software for the meat industry. Kate’s motto is to “live deliciously.” She believes in going back to our ancestral roots and learning historical comfort foods. As a volunteer, Kate also leads the 1870’s historic garden at the Lutze Housebarn which flourishes with heirloom varieties of the era. Kate is the owner of Executive Gardening Institute and thrives on a farm in Kettle Moraine with her husband, chickens and a black cat. Chef Shelly Platten is an award-winning cook who has been involved in the food industry for over twenty years. She has been teaching classes and giving chef demos throughout central Wisconsin in venues ranging from adult continuing education courses and middle school summer camps to farmers markets and women’s wellness days. In 2016 she graduated with high honors from FVTC with an Associates Degree in Culinary Arts and is a certified ACF culinarian. Over the years she’s entered recipe and cooking contests as a hobby and has won over 80 national and state prizes. Her winning recipes have been featured on Good Morning America, local TV morning shows, and in Better Homes and Gardens, Cooking Light, Taste of Home and Vegetarian Times magazines. Industry experience includes being a head chef and baker, restaurant manager, and recipe developer for several cafes and grocery stores. Her passion for healthy cooking will continue on in her career direction of working with corporate wellness programs and personal chef events to harness the power of good eating. She’s excited to be part of the Relish instructor team and loves the fun interaction and shared passion for food these classes provide.